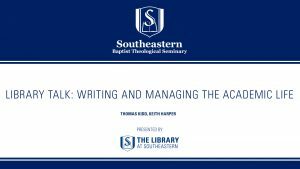 Thomas Kidd, Distinguished Professor of History at Baylor University, and Keith Harper, Senior Professor of Baptist Studies at Southeastern Seminary, discuss “Writing and Managing the Academic Life” as part of the Library Talk. Bruce Ashford answers questions about engaging in political discourse as a Christian. He has written the book One Nation Under God with Christ Pappalardo. He has also authored several articles concerning Christians and their role in politics on Fox News and the Gospel Coalition. He is also the Provost at SEBTS. 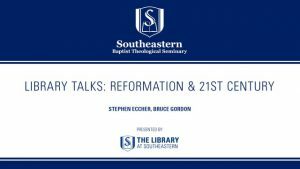 Stephen Eccher & Bruce Gordon discuss the reformation and its impact on the 21st century. Dougald McLaurin and Craig Bartholomew discuss what it means to be a well rounded scholar during a Library Talk at Southeastern Seminary. 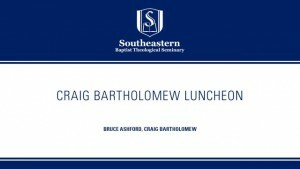 Bruce Ashford interviews Craig Bartholomew during a luncheon at Southeastern Seminary. 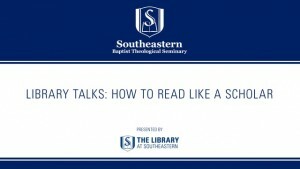 John Hammett, Keith Whitfield, Jeremy Evans, and Dougald McLaurin come together to discuss practical ways to help you read well, take notes, and manage your time well. 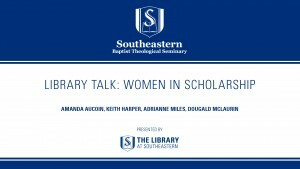 Join Amanda Aucoin, Keith Harper, Adrianne Miles, and Dougald McLaurin, as they discuss what a career in academics looks like. 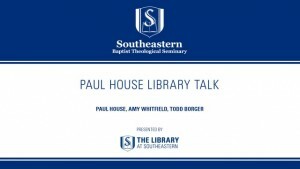 Todd Borger and Amy Whitfield interview Paul House at a Southeastern Library Talk. Dougald McLaurin interviews Russell Moore about his new book “Onward: Engaging the Culture Without Losing the Gospel” in a library talk.